Swank off your business name and image with custom imprints on these incredibly robust in nature, yet pretty looking bakery boxes that are spacious and air tight to keep your items uninjured and fragrant. 17 X 11 X 3"
18 X 13 X 3"
19 X 13 X 3"
19.5 X 14 X 4"
19.5 X 14 X 5"
23 X 12 X 3.5"
26.5 X 18.5 X 4"
28 X 20 X 4"
28 X 20 X 5"
These boxes are perfect for selling and storing donuts. They have a Kraft interior and are white on the outside. 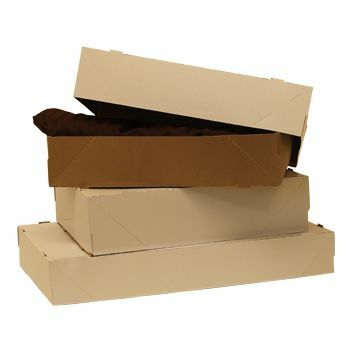 These boxes are made of high quality material that is 100 percent recycled. These high quality boxes are the perfect way for the picture perfect donuts you make, and it ensures that your customers will be able to enjoy them while they are in a good condition. These are also very competitively priced and are one of the best deals available. These donut boxes are 16 X 11 X 3 ½, which makes them perfect for storing donuts.